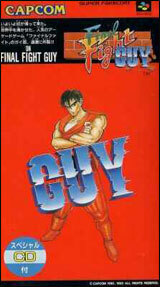 Final Fight Guy for Super Nintendo is the new released version from Capcom and this time with Guy on the roster as a selectable fighter. It's up to you, as either Mike Haggar or Guy, to take to the streets and battle the Mad Gear Gang in order to rescue Haggar's kidnapped daughter. Throughout the five levels, you'll find various weapons scattered about, which can really give you the upper hand in a fight.